Call WestSide Electrical Perth now to get your oven repaired and back cooking today. We repair elements, thermostats, fan motors, timers, displays, wiring, selector switches and much more. We service both the northern Perth suburbs and the southern Perth suburbs also offering free quotes. All our team members are highly experienced with oven repair and are ready to help with your next enquiry today. We also offer our Jandakot customers an oven, stove and cook top installation service. Click here for more information. We service & repair all makes and models of ovens. We offer free accurate quotes for oven repairs over the phone or via email and all prices quoted include GST, parts & labour. All our staff are fully qualified and insured. Our competitive pricing and quality workmanship means you will be 100% satisfied with our oven repair service. We are now offering all our Jandakot customers an oven disposal service. Enquire today for more information. Westside Electrical Perth is a market leader in oven, stove & cooktop repair across all suburbs in Perth including Jandakot and the first to offer a fixed price service for many cooking appliances. We will repair your cooking appliance hassle free and on time. With our exclusive fixed pricing repair service you can be rest assured the price we quote is total price inclusive of GST, parts and labour. When you contact our customer service centre, you will need to provide us with a make and model number of the appliance and a detailed description of the fault. Our vans carry a wide variety of oven, stove and cooktop spare parts. This means we can repair most appliances on the day with minimal downtime to the customer. Our company focus we strive for is to complete 90% of appliance repair jobs on the first visit. Most electric ovens that have a fan at the back will have a circular heating element which sits around the fan. When the fan is operating it will distribute hot air evenly around the oven. When the fan force element fails you will be able to hear the oven fan turning but the oven will produce little to no heat. Oven fan force element replacement is the most common type of oven repair service. All electric grill elements are located at the top of the oven and are held in usually with metal clips and screws at the back. Some grill elements can operate with a fan grill setting while other grill elements operate with simply the grill itself. It is quite easy to tell when a grill element has failed. Simply turn the oven on and set the oven to grill. If the grill element is not heating, you will require a replacement grill element. 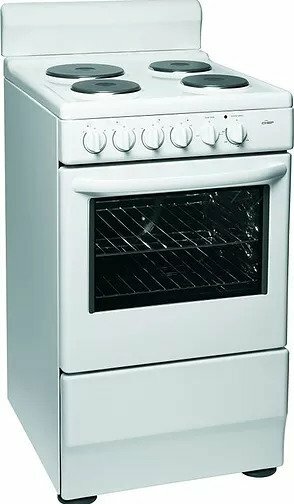 Conventional oven elements are primarily located at the bottom of the oven while other ovens have a conventional element at the top and bottom. Some models may have an element hidden from sight under the metal casing. Conventional oven elements don’t use a fan to heat the food. It is quite easy to tell if a conventional oven element has failed. If the element is visible it simply will not glow red or produce heat when the conventional setting is selected. Oven fan motors are located and housed at the back of the oven and are usually set behind a metal face plate. Oven fans are popular with everyday cooking as they provide fast even cooking heat throughout the oven. The oven cooling fan is located inside the oven usually behind the oven controls and selector switches. They are used to keep the electrical components inside the oven cool and also used to keep the cabinetry surrounding the oven free from heat damage. When oven fans fail they can often make a grinding sound as the bearings can fail. Other faults include the fan ceasing in which case the fan will turn at a very slow speed. The most common fault is the fan motor burning out, which will result in the oven fan not turning at all. The oven thermostat is the temperature dial on the front of your oven. It links to a metal probe inside the oven which tells the heating element when to turn on and off during a cooking cycle. When an oven thermostat is faulty it will not tell the element to turn on and off. This will cause the oven not to heat at all or evenly or it will cause the oven not to heat at all. It can be hard to see whats cooking when your oven globe has failed. Oven globes are quite easy to replace and our trained technicians carry most makes of globes on hand at all times. When you come through to our customer service center you will be asked to provide our team with a make and model number of the oven, stove or cooktop you would like to be repaired. We will then quote you with a fixed price to have your cooking appliance repaired, which means no hidden costs once the repair is complete. The make and model number of ovens can be located inside the oven door next to the oven seal. Sometimes the make and model number may have faded over time and may not be able read properly. In this case if the oven manual is still available the make and model number can be located in there. We are Jandakot first choice for fast same day oven, stove and cooktop repairs. We have successfully repaired and serviced thousands of cooking appliances across the Perth metropolitan area including Jandakot. Backed with our workmanship guarantee, you can be confident Westside Electrical Perth can get the job done on time and on budget. Tell us what you need and we will get back to you with a quote. Remember to let us know what suburb you live in. At Westside Electrical Perth we are your first choice for high quality electrical services at affordable rates.